(Reuters) - An oil train was still on fire and leaking in West Virginia on Tuesday, a day after it derailed and erupted in flames, according to CSX Corp, which said the train was hauling newer model tank cars, not the older versions widely criticized as prone to puncture. The train, which was carrying North Dakota crude to an oil depot in Yorktown, Virginia, derailed in a small town 33 miles southeast of Charleston, causing 20 tank cars to catch fire. 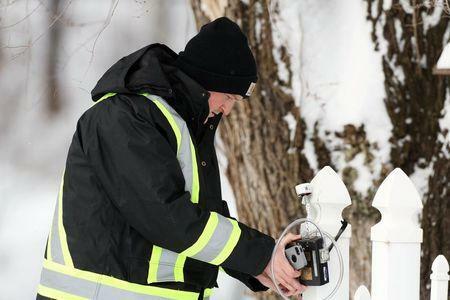 Several were still leaking oil on Tuesday. All the oil tank cars on the 109-car train were CPC 1232 models, CSX said late Monday. The CPC 1232 is the newer, supposedly tougher version of the DOT-111 car manufactured before 2011, which was faulted by regulators and operators for a number of years. U.S. and Canadian authorities, under pressure to address a spate of fiery accidents, are seeking to phase out the older models. The U.S. Transportation Department has recommended that even these later models be updated with improved braking systems and thicker hulls. The fires, which destroyed one house and resulted in the evacuation of two nearby towns, were left to burn out on Tuesday, CSX said in a statement. No serious injuries were reported. CSX said the cleanup of oil will begin when it can safely reach the site. In the meantime, delays are expected on the line. 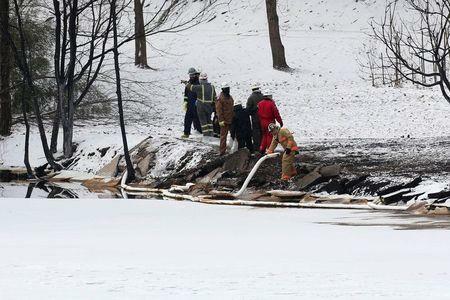 None of the 25 tank cars that derailed fell into the nearby Kanawha River, CSX said. On Monday, officials said at least one car had entered the river. Water tests along the Kanawha River have so far come up negative for traces of oil, according to a spokeswoman at the West Virginia Department of Environmental Protection. A nearby water treatment plant has been closed, she said. This accident followed the Feb. 14 derailment in Ontario of a Canadian National Railways train from Alberta. It was also the second derailment in a year along this CSX line. A similar incident in Virginia involved a train also headed to Plains All American Pipelines LP's oil depot in Yorktown, Virginia. 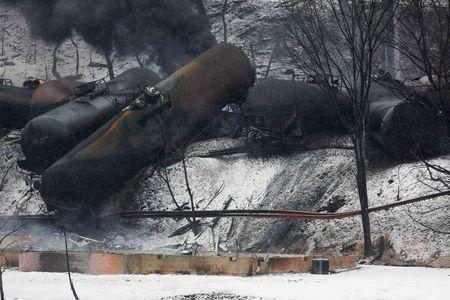 A boom in oil rail shipments rail across North America has heightened focus on safety. In July 2013, 47 people were killed in the Quebec town of Lac-Mégantic after a train carrying crude oil derailed and exploded.